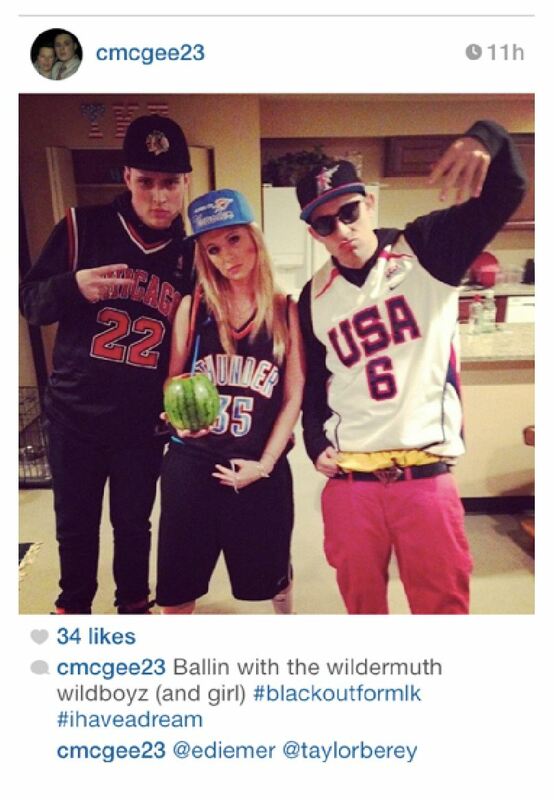 Arizona State University has suspended the Tau Kappa Epsilon fraternity while it investigates the “unregistered Greek event” in which fraternity members dressed in basketball jerseys, flashed gang signs and drank from watermelon cups. Anyway, these geniuses then posted the photos of the party on social media because Internet narcissism trumps the savvy surreptitiousness of, say, the Klan, whose members wore hoods and didn’t post photos of their terrorist acts with the hashtag #whitepower. If the Tau Kappa Epsilon members had access to Instagram, they could have also Googled actual photos of Martin Luther King, who I believe never made public appearances in basketball jerseys or flashed gang signs during his speeches. I presume, though, he enjoyed watermelon on a hot day just like anyone else. Who doesn’t like watermelon? For a self-described “blackout party,” it’s odd that they basically just look like House of Pain. People love telling on themselves. Was this supposed to be funny, because I LMAO!